I came home from work today, Monday, and started eating, and an hour later, on my fourth snack food, decided I wasn't going to run today. Tiredness is a funny thing or an interesting thing. When I made it over 13,000 feet on Mt. Rainier Saturday I was tired. Not the tired from having just done six miles and 8000 vertical feet of elevation gain, but a deeper tired, similar to when I have been training (running) a large volume for weeks or months. It's like my body wants to eat and sleep, and that's about it. Some people are probably laughing or crying right now reading this. As if climbing a mountain, the weekend after a successful 8000 meter mountain expedition, wasn't enough, that's when I realize I am tired. So I'm taking a rest day. My coach hasn't sent me a schedule yet so I don't have any workouts to miss yet. It's a good reminder that we need recovery, despite how I may act and describe the ninth hardest experience in my life, that's still pretty hard. 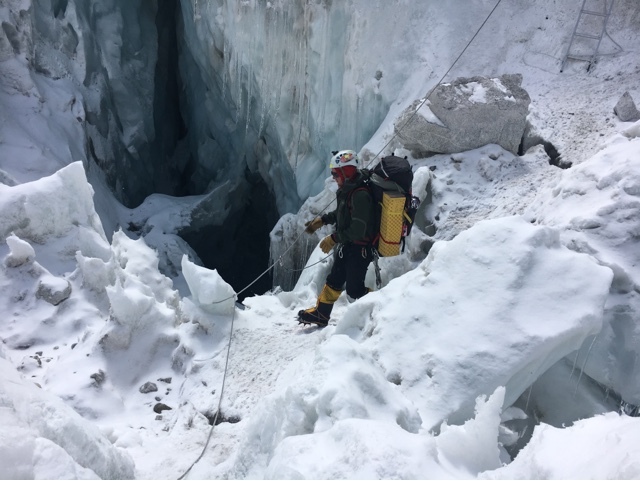 Crevasse crossing in the Khumbu ice fall.